A pregnant Alameda city councilwoman wants to bring all city-owned buildings into the 21st century with dedicated rooms for new mothers to nurse their babies. Councilwoman Malia Vella admits it wasn't until she was pregnant that she understood the lengths working moms had to go through to breastfeed or pump milk in private. She says hopefully by the end of the year, Alameda City Hall, built in 1895, will catch up with the times. Vella is due to give birth to her baby boy in about a month. In the meantime, she’s figuring out how she will soon have to juggle life as a working mom. "OK, where am I going to breastfeed?' she said. "If I need to pump later on, where am I gonna do that?" Even though roughly 100 people work at Alameda City Hall, the building does not have a designated lactation station for nursing moms. There’s also no diaper-changing tables in the bathrooms and no gender-neutral restrooms. Vella says it’s time for the antiquated building to get up to date. "Members of the public are coming to our meetings," she said. "It’s not just City Council that meets here; our school board meets here. We want to make sure that all of the members of the public have a safe place." Vella says the city is looking into purchasing nursing station pods similar to ones provided at Oakland International Airport. "I think it’s great," Alameda mother Hannah Hebebrand said. "When my kids were little, I had to find like a bathroom or a park bench or a dressing room in a store or something." Because purchases have to go through a budget process, Vella says it’s unlikely the pods will be installed by the time her baby is born. "Right now, in the interim, I’ll probably use the HR conference room, which is a floor down, which will be a little disruptive for meetings," she said. 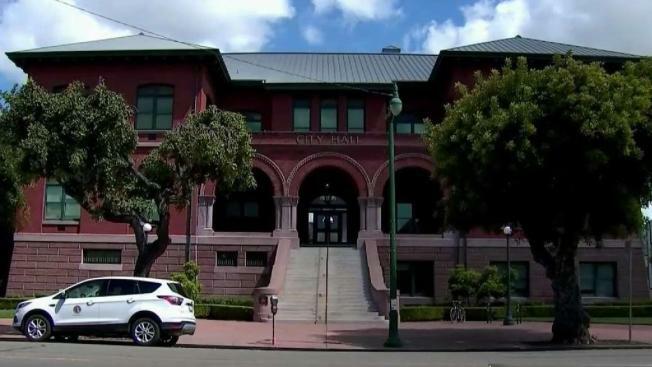 The city of Alameda says the director of Public Works is taking an inventory of city-owned buildings like libraries, rec centers and the police department to find out what needs to be added and upgraded to make the city compliant with state laws.